Your cat may have been a contented couch-potato-kitty all winter long, but now spring breezes are drifting through the open windows and bringing with them the allurements of the great outdoors. You’ve noticed your ca t has been positioning themselves next to the front door, ready to make “The Great Escape”. How can you enter and exit without seeing a blur of fur rushing past you? Try carrying a shaker can (an empty soda can with seven pennies in it) and give it a good shake as you approach exiting out the door (try not to let the cat see that the noise is coming from you, make them think it is the door). If you are coming in from outside, shake it as you are entering the home. Most often, caught at the right time it will only take once or twice. 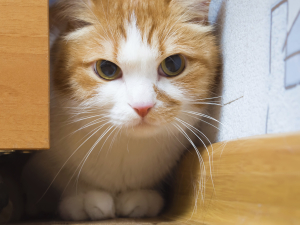 Your cat will associate the frightening noise with the door and not you. You want them to fear the door and stay away. If your consistent enough the message will be loud and clear. You may have to experiment with a variety of sound deterrents before you find one that makes your cat stay away from the door. One cat owner discovered that the personal safety alarm on her key chain was the perfect solution. Just in case you are not successful, it is wise to outfit your favorite feline with a safety, or break-away, collar and an identification tag. To satisfy your cat’s need for fresh air and adventure consider introducing them to a harness and leash and letting her safely explore the great outdoors with you by her side. An outdoor enclosure for your cat is a great way to satisfy their need to see, hear and smell the great outdoors.